Helen- This is our first weekend with a car to do as we please by ourselves!! 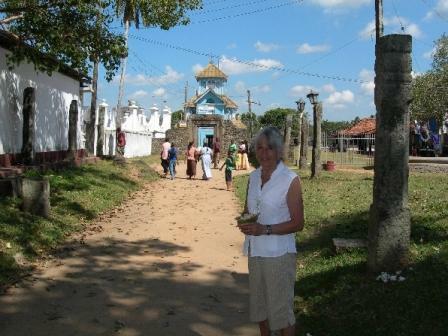 We decided to go east to visit the next few towns and see the Buddhas! 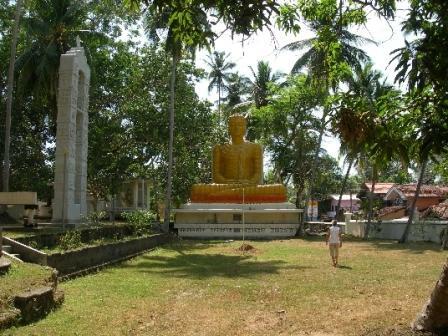 The first town was Dondra and has the tallest standing Buddha. This concrete structure is fairly new. As we entered the temple area, Tom bought some little white flowers with orange centers wrapped in large green leaves forming a cup. These were being sold to be presented as an offering at the various altars. 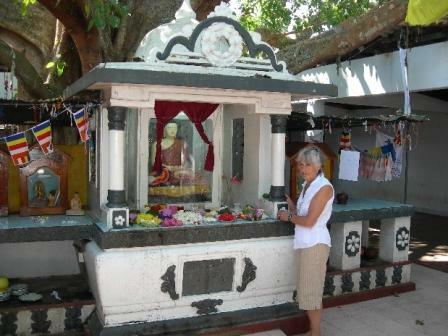 The first temple area was around a rectangular altar which was in front of a Bo tree. They believe Buddha received his enlightenment and in the process discovered how to relieve people’s suffering while sitting under such a tree. People walked around the tree with incense saying prayers, others chanted at the sides, others hung streamers of string tied with pieces of cloth. On the altar were offerings of rice, fruit, tea, and flowers. We walked to the next temple and inside was a huge reclining Buddha (they believe that Buddha meditates in three positions: sitting, lying down, and standing/walking). These temple areas had the walls and ceiling covered with painted murals depicting the beginning and continuation of Buddhism and large statues guarding the entrance to the Buddha’s resting place. 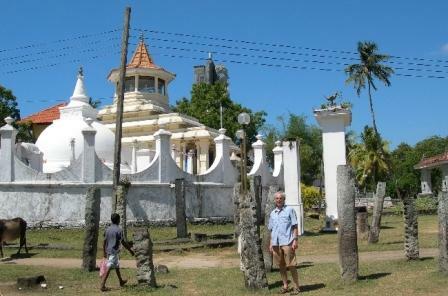 There were many smaller temple areas spread around the grounds. One row of temples had smaller rooms with colored lights decorating the inside and outside of their cubicles and someone at the door beckoning you to come to his area. We went to one and he began to chant and ring a bell…then he took a golden cord and as he chanted he wrapped it three times around my right wrist and then tied it in an intricate knot. He repeated the process for Tom (he was video taping me the first time) and it only cost us about $1 donation for both! There were lots of cows and strangely most had their heads in garbage cans…wondering and then taking a closer look found that they were eating the flowers that were thrown away. Leaving the temple we saw our first really big lizard. We have since seen one near our home. 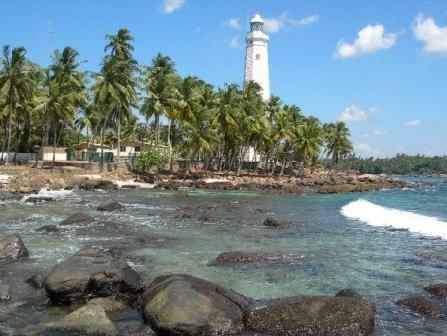 This town is also known for the lighthouse at the most southern tip of Sri Lanka. 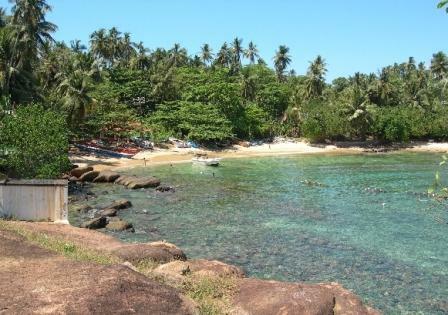 The area is very clean and has a rocky coastline which means coral areas and fish!! The keeper told us it was designed and built by the British in 1889 and is still functioning for about 100 ships that pass by each day on their way east or west. As Tom has mentioned earlier, as you face due south, there is only the Indian Ocean, no land until you get to Antarctica (5000-6000 miles? away)! 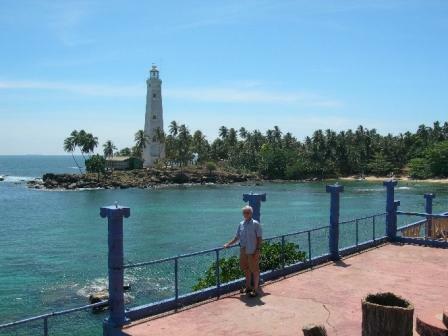 On the other side of the lighthouse is a lovely cove, perfect for snorkeling and we hope to go back there soon. Across the cove area is the Lighthouse Restaurant and we had lunch there. It took us quite a few tries to find the correct road to get there but it was well worth the effort since the grilled fish dinner with boiled/sautéed vegetables was the best we had so far!! Leaving we had to wait on the road while a big truck was installing a concrete light post and we couldn’t get around him. Next stop was a shell shop along the road. The man was very nice and showed us his new shop. He dives for the shells and cleans and polishes them. Most of the bigger ones were pretty expensive for me ($30-40) but I bought two smaller ones for $3 to add to my home collection. Driving toward the next town we stopped at a stand (there were lots of them along the road) selling cashews in little bags. Some had spices on them and others were boiled…we didn’t buy any…but then just down the road we passed a large golden sitting Buddha. Tom made a U-turn and we stopped to take a few pictures. There was also a new bell tower there. While we were walking around a monk came out and spoke English with us. He took us into the temple area and explained the religion and murals to us. He said that this was a retirement home for old monks and he volunteered his time here (his real job was a principal at a school). He took us up to the living quarters and we met several of the old guys who gave us toothless grins and waves. Another man (the cook) runs up to us and offers us something to eat. We decline since we just had lunch but he proceeds to bring a big cold papaya and cut it for us. How could we refuse and glad we didn’t. It was the sweetest one we tasted and he squeezed lime over it which really intensified the taste. It was great not having a deadline and being able to stop when we wanted and stay as long as needed. 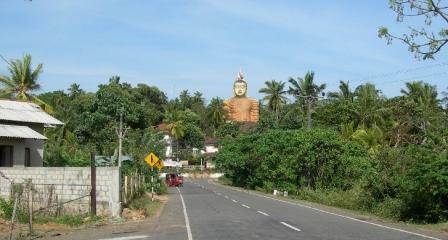 Our next destination was the largest sitting Buddha in Sri Lanka. It is about 8 stories high and to prove the height, there is an 8 story staircase behind him. 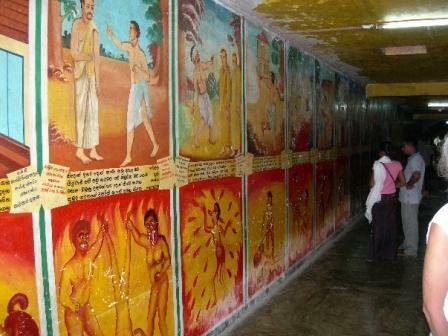 This staircase is full of murals as you climb to the top of the Buddha’s head and look out at the surrounding area. This Buddha is made of tiny tiles and is really impressive. 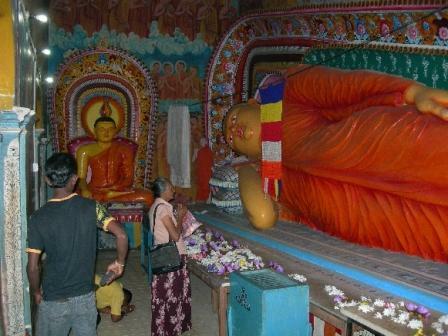 Here again is a temple area with other very large reclining and sitting Buddha with murals and life size statues depicting the religions history. This time it showed that the pre-Buddhist people were hunters and meat eaters. Seems we learn a little more from each temple we visit. The most interesting and grossest thing here was the hallway of Hell. 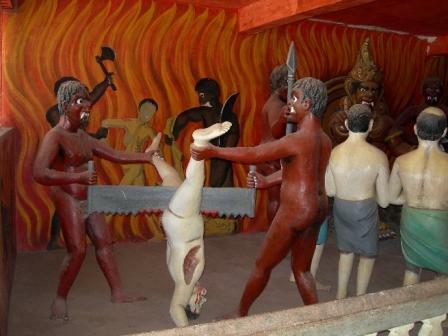 It had life-size statues depicting what horrible things would happen to you if you disobeyed the rules of the faith. People were burning in hell, being speared, being sawed in half with blue tongue hanging, eyes bulging out, grinning demons doing these awful deeds. 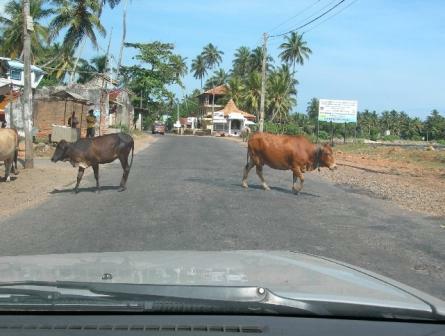 If that wasn’t enough to give you a scare…especially us since we ate meat and weren’t considered part of the faithful. This area then narrowed into a long corridor depicting the sins on the upper half of the wall and the punishment on the lower. If you killed a chicken by wringing its neck, you may spend your time in hell having your neck continuously wrung! I am sure that you can imagine the rest without me describing it! Our last destination for the day was a blow hole. Before we finally found the spot, we drove down to the fishing boat area. We paid 50 cents entry fee and were told not to take any pictures. 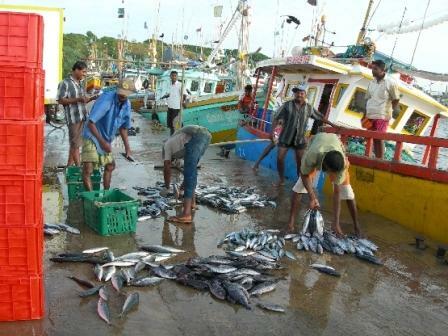 It was pretty neat seeing all the brightly painted boats and the men counting and weighing the fish for the buyers. There was one boat with very big tuna (of course Tom took pictures). On the way back we parked in a private front yard for the blow hole. The owner spoke good English and took us to the blow hole (though we could have found our own way). This is not the right season so we only saw the hole but no big splashes. On the way down we bought some boiled corn cooking in a large pot. There were little stands all along the route. The corn was really tough and I took a few bites and smiled but couldn’t wait to get rid of it. We also bought some bananas. We had to hustle to get home before dark. …during stormy seasons this blow hole shoots the water up to 300 feet into the air.